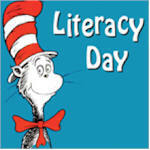 DIY - Literacy Day fundraiser! educational tools for their students. Instead of having children sell candy or coupon books, the assistant principal said the school has decided to get students involved in fundraisers that help them learn something new. Students got a big injection of reading-related activities, even in their math and physical education classes. Part of the literacy day included visits from coaches, principals and staff from area schools, as well as a former Denver Nuggets player and the announcer for the Colorado Rockies. They read from their favorite books and talked about how reading skills helped their careers. To motivate children to gather pledges and read as much as possible, the school gave out fun incentives, such as gift cards to local bookstores. Top earners from each grade received perks, such as being principal for the day and having the principal attend class in their place. The student who earned the most money won a Nook e-reader. The school will continue to organize the Read-a-Thon each year.